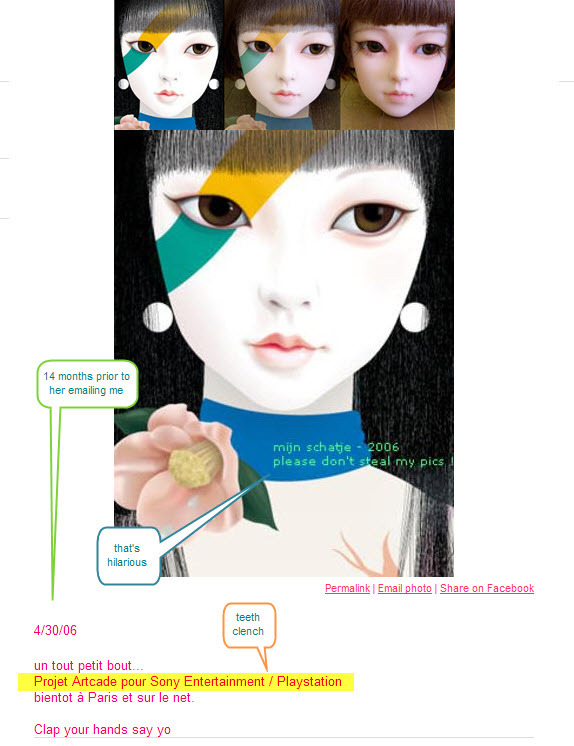 I have seven *probable* cases where this artist has used my doll photography as source for her digital artwork. While I didn't recall giving any such person permission I have gotten requests in the past for permission to use my photos as models. A deep search of the vast swampy regions of my mailbox turned up a little query from a couple years go. 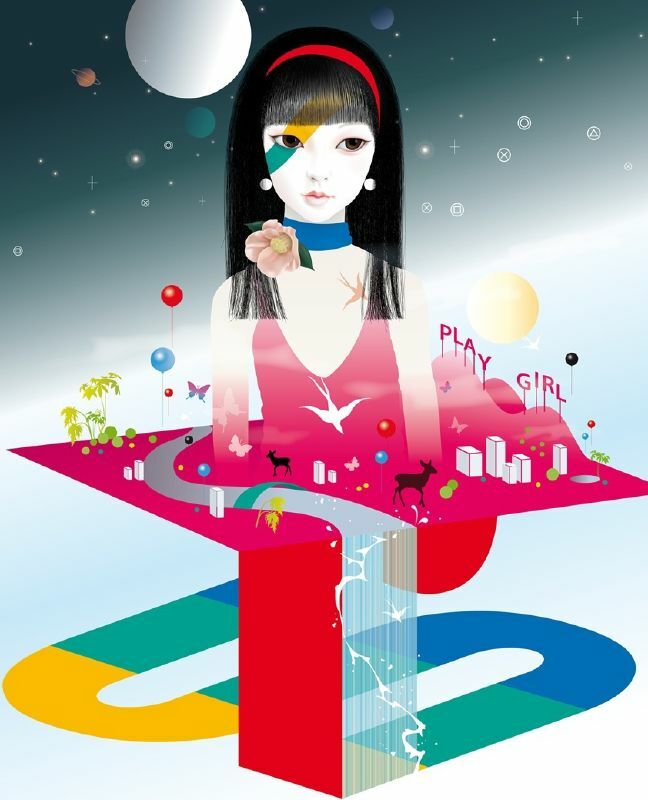 In July 2007 I gave her permission to use a single photo of a doll to "draw" from, she now states, June 2009, that this "drawing" didn't work out and she never showed the print. I've always tried to be supportive and sharing with fellow artists, hence my original enthusiasm to help (I'd also just been to Paris for the first time), and since I never heard from her again I never thought anything of it. 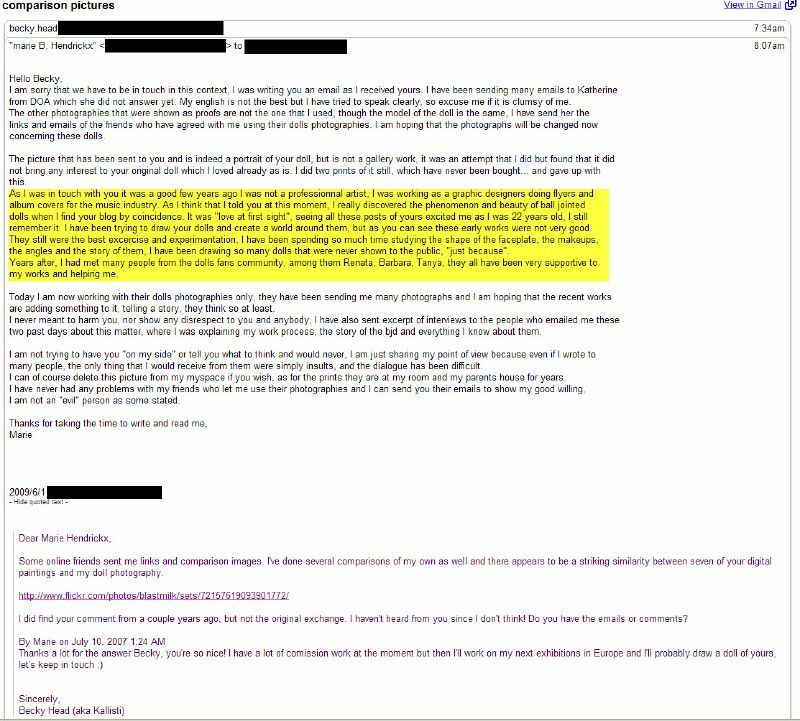 As it turns out she'd already been using photographs from my website for well over a year, including for profit endeavors for Sony Playstation et al. The grand total to date is SEVEN source photos have been turned into countless prints, magazine covers, etc. The images in question are so exact that it is fair to say they are imported into a vector drawing program like Adobe Illustrator and traced. The final digital painting often maintains the face-shape, lighting, distinctive make-up features, etc. Eyebrows are one of the non-sculpted features of these dolls that are generally painted by the face-up artist. In somecases she's removed these. Other cases, not, and these are telling. Here you can clearly see the distrinctive BlastMilk Effect™ swoopy eyebrows on Lulu. I'd like to believe that her intentions were originally honest and fair, but that she perhaps took it too far. The dolls themselves (the effort of the artists who sculpted them, the manufactures who produced them, not to mention the time I put into painting and photographing them) are very compelling, but as their luminous faces are the central theme to 99% of her gallery work, it seems a bit disingenuous to claim them as products of her own imagination. NOTE: on 6/2/09 after a brief exchange, she stated that she would be "deleting the photos that were done using you own sources pictures... the said pictures are not for sale anymore, two of them have never been." I would like to state that those prints that were "not for sale" was because they were already sold out at this time (not sure of her edition size but at $1000+ a pop, you do the math). Not to mention the numerous licensing deals for books, calendars, fashions etc that have been done. She claims she assumed she had my permission in perpetuity since I had offered to let her "draw" from a photo of one of my dolls. 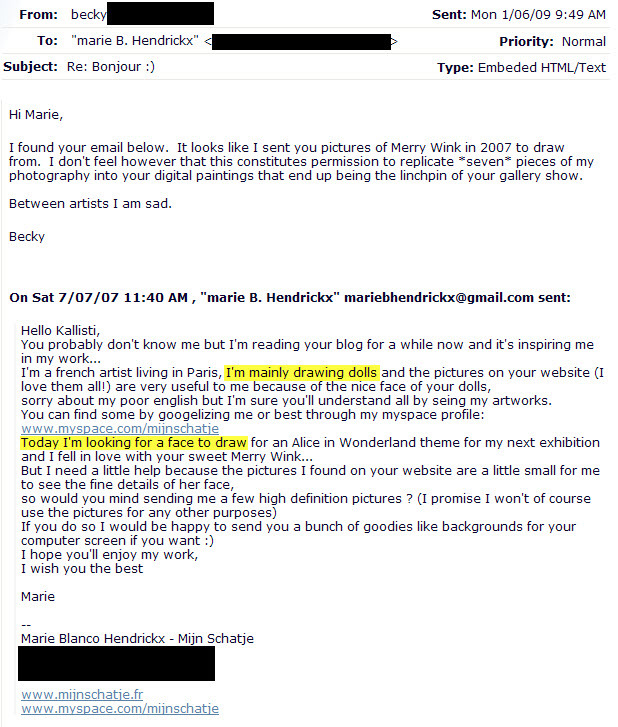 She never used that I've seen the image I *did* send to her, but her use of my images as source material pre-dates the 7/2007 request by almost two years, so the point is moot.